Italian second row Marco Bortolami is a hugely influential presence at both international and club level. A measured and thoughtful character off the field, Bortolami is dynamic, committed and powerful on it. The 6'4'' Bortolami hails from the northern Italian city of Padova, where he made his professional debut for Petrarca Padova at age 18. A run as the captain of the Italian U21 side led in June 2001 to his full debut for the Azzurri against Namibia. Bortolami's rise was not to stop here, as at the tender age of 22 he was made Italy's youngest ever captain for the 64-10 mauling at the hands of the All Blacks in 2002. Bortolami continued his form into the 2003 World Cup, but found himself sidelined for the Italian's key clash with Wales having dislocated his clavicle in a bruising encounter with Canada. After Italy's exit from the 2003 tournament Bortolami recovered to feature in the Italian Six Nations campaign in 2004, during which they registered a win over Scotland at the Stadio Flaminio. Bortolami again found himself in possession of the captain's armband on the Italian summer tour to Japan in 2004. The Azzurri recorded a 32-19 victory in Chichibunomiya. His growing reputation led to a switch to French side Narbonne, where Bortolami would ply his trade for two seasons. In 2006 he made a high profile switch to the Guinness Premiership when he signed for Gloucester. Bortolami walked into the starting line-up and also found himself as the club's captain on debut. On the international stage, Bortolami led Italy to their most successful Six Nations finish in 2007. Italy beat Scotland 37-17 at Murrayfield to record their first away win in the tournament before seeing off Wales in Rome, the first time that they had ever won two games in a tournament. Bortolami's 2007 would not continue in this same vein of success, as his Italian side crashed out of the 2007 World Cup following a crushing defeat by New Zealand and a nail biting loss to Scotland. Bortolami was replaced as Italian captain by Number 8 Sergio Parisse following the appointment of Nick Mallett as new coach. During the 2008 Six Nations Bortolami missed the opening games against England and Ireland with eye and neck injuries. He returned as a replacement against Wales, before finishing the tournament with the Italian home victory over Scotland. After two years in the national set-up - Bortolami was discarded and prior to being named in Italy's squad for the 2011 World Cup - last turned out for the side against South Africa in June 2010. 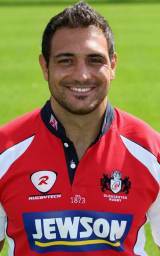 Despite not featuring on the international scene - Bortolami is a regular for his club side Aironi - having left Gloucester in 2010 - in the RaboDirect PRO12 league. He will captain them for the 2011-12 season in their second season in the Celtic league.